In this article we try to find out what are the best exercises for the high chest . To understand when we activate the clavicles of the great pectoral, let’s start from the theory to have a practical and applicable answer. 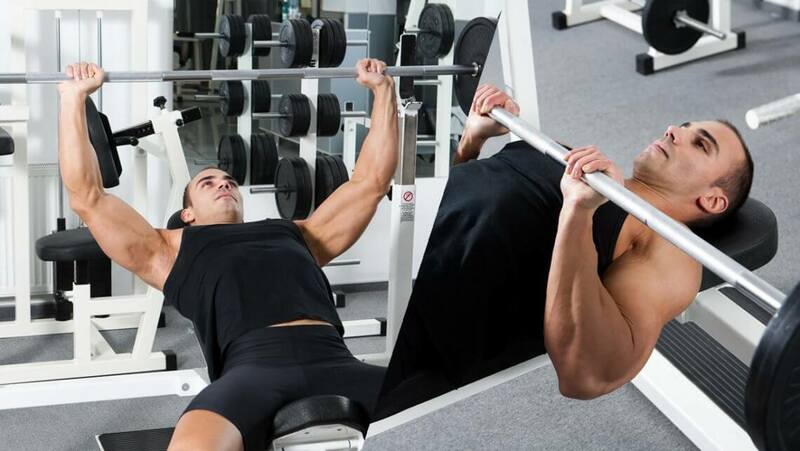 Always the inclination of the bench in the gym is considered the best strategy to modulate the activation of the different portions of the great chest: if you want to activate and develop the chest higher you have to tilt the bench, if you want to activate and develop the lower chestmore on the contrary, you have to decline the bench. But is it really like that? Should you really incline the bench to stimulate the upper part of your chest? Let’s find out together through anatomy, biomechanics and scientific literature. At the anatomical level the pectoral consists of two distinct portions that differ in some functions. The high chest (clavicular portion) conveys, flexes and intrudes the humerus, the low chest (sternal-costal portion) adduces, extends from a position of maximum flexion and intranges the humerus. the more we decline the bench the more we will get the opposite effect with a more muscular work to the prerogative of the lower chest (sternal-costal component) compared to the high chest (clavicle portion). The thrust from this position provides for a shoulder with a maximum extension and a humerus with a few degrees of flexion, proportional to the degree of declination of the bench. In the literature some studies, even recent ones, have analyzed the electromyographic activity of the different pectoral bundles during exercises with different inclinations of the bench. In summary, the studies have reached the following important conclusions. All studies agree that the inclination of the bench is an element that significantly influences the activation of the high chest (clavicular portion). The only evidence of a greater recruitment of this portion is from 45 ° up , while below these degrees there are no real differences compared to a flat bench execution (Barnett et al 1995, Glass, Armstrong, 1997, Trebs et al 2010, Luczak et al 2013). As the inclination of the bench increases, the activity of the anterior deltoid also increases and that of the lower chest decreases (the sternal-costal portion). The exercise performed on a very inclined bench then indirectly generates high activation levels even in muscles different from the target. Barnett et al. In 1995 show that the tight grip on the barbell increases the activity of the high chest regardless of the inclination of the bench and therefore also performing the exercise on a flat bench (Barnett, 1995). Further studies validated in the literature indirectly confirm this indication by evaluating muscular activation at varying the width of the hands during Push-ups, detecting a high activation of the pectoralis major with a reduced hand width (Kim, 2016; Marcolin, 2015). In light of these three points it is possible to make some biomechanical reflections before reaching conclusions to be reported in daily practice in the weight room. All three points above are united by the same characteristic: the variation of the movement plane and, consequently, of the muscular involvement. In fact, the first point shows a greater activation of the high chest from 45 ° onwards of inclination. As already mentioned above, this should not be too surprising, since with this inclination the plane of movement changes from transversal (horizontal adduction) to a sagittal / frontal hybrid (flexion / abduction) with the consequent greater activation of the humerus flexors between which are in fact the upper chest and (as indicated in point 2) the anterior deltoid. Moreover, the fact that the decrease in grip width influences muscle activation in a similar way, as reported by Barnett in 1995, confirms what has been said: tighten the grip approaching the elbows to the bust, this changes the work plan and the movement performed by adduction becomes bending, thus involving the upper chest as a flexor of the humerus to a greater extent. Biomechanical reasoning and scientific studies go hand in hand. Let us summarize in a few points what you must bring home about the subject “high chest and low chest”. The evidence in the literature shows significant increases in upper chest activation only from 45 ° inclination of the inclined bench . Raising the bench less than 45 ° to put more emphasis on the high chest remains a choice that today makes little sense. However, it should also be emphasized that the more the inclination of the bench increases, the more the intervention of muscles that are not the target of the exercise is increased, including the front deltoid. The execution with a declined bench activates slightly the upper chest and the lower one. However, I remember that a correctly executed Piana Pan increases the working angle of the pectoral, also increasing the involvement of its lower portion. In addition, exercises like Parallel Dip and Bar Tractions are just as good at recruiting this portion. By virtue of this, it therefore appears not very sensible to perform dumbbell extensions upside down, given the variety of existing effective exercises. Optimal executions at the Piana bench or at the cables effectively activate the whole pectoral muscle in toto. Focus on these and you will get excellent results. In a context of research of muscle hypertrophy it will be absolutely legitimate to insert the inclination of the bench in the training card as a variant of execution and work plans, but it will always be important to do it with the right awareness. In conclusions the best exercises for the high chest are: the inclined bench starting at 45 ° and the narrow bench . See Another Article: Crosses to Cables: execution and variations.